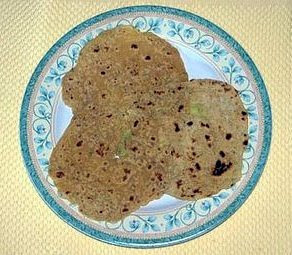 This is one of the staple foods made by Maharashtrians. And being from Bombay, I can say that over the years I have had more than the fair share of vada pavs (pronounced vadaa paav) made on streets of Bombay, India. Pav is an Indian bread roll that is softer than ciabatta rolls and dense in structure. The usual way vada pavs are eaten in Bombay is that the fried vada is stuffed in between the roll spiced up with tangy and hot green chilli sauce. I have also eaten a variation where the unfried potato is stuffed inside the paav, and then the paav with the potato in it is dipped in batter and then deep fried. That is served with ketchup and is very tasty as well. Why wouldn't it be? My friend Padma makes very very tasty vadas and are one of the best I have had. So here then is the recipe. Try it out and enjoy. Boil and mash the potatoes. Make sure the potatoes are not over-boiled. In a wok, pour 1 tbsp vegetable oil. Once the oil heats up, add grated garlic, finely chopped green chillies, and turmeric powder. After 30 - 45 secs add the potatoes and salt to taste. Mix well over medium heat. Add the chopped coriander leaves. After the mixture cools, make lime sized balls. Mix the batter ingredients with water. Dip the balls in the batter and deep fry in medium to hot oil till the vadas are golden brown. Serve the vadas hot with ketchup, or any of the chutneys you can buy from any Indian grocery store. Padma is my close friend Sriram's wife. 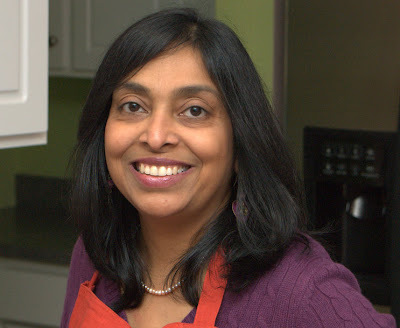 Padma lives with her husband and son in Westchester County. She works in Westchester and is a Physical Therapist (a good one at that) by profession. This is something I love to prepare when in hurry, or not in the mood of cooking but hungry. Adult friendly, and very kid friendly as well. 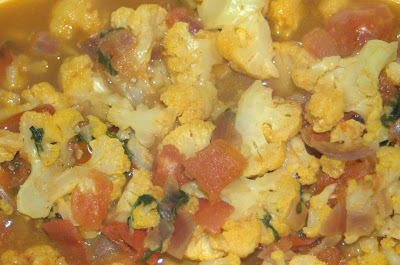 Cut the cauliflower and tomatoes into small pieces (1/4 inch size) and set aside. Cut the onion into smaller pieces. In a wok or similar utensil, heat 1 1/2 tbsp vegetable oil. As it gets hot, add the hing, yellow mustard powder and red chilli powder. Make sure it doesn't get burnt. As soon as you get the aroma of the spices in the oil, add the onions and saute them. 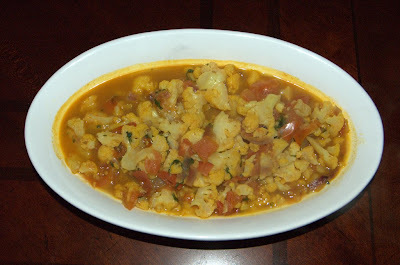 After a minute or so, add 1 1/4 tsp coriander powder, the cauliflower, and saute for a minute more. Add the tomatoes to this, salt to taste, and 2 cups of hot water. Boil until the cauliflower is just cooked perfectly (where it maintains its firmness) and the tomato skins start separating. At this time add finely chopped coriander leaves. Cook for another minute or so on high heat, so that the fresh coriander flavor permeates through. This simple and yet wonderful vegetable dish can be served with chapatis (tortillas), with rice, or just eaten as is in a bowl. If you want more tanginess, just squeeze some lemon juice and you are good to go. Ingredient Substitute/s: You can replace the cauliflower with potatoes, or just add potatoes to the above. As a matter of fact, any vegetable compatible to this mix would be great. Examples would be green pepper, white radish, green peas, or spinach. Just make sure that the final proportion in terms of quantity of vegetables matches the recipe above so as to make sure that you get the taste right. This was something my wife Anita created at a time when we were at our wits end to come up with an idea of feeding our daughter Tvisha vegetables. Not that we still aren't having trouble with feeding her vegetables. That's a story for another day which I may post on my other blog. This has turned out to be something that my daughter relishes at least when its fresh. She has it with plain yogurt. For us adults though, spice this thing up a bit and it's a yummy dish. I have gone ahead and modified the recipe to suit our palettes. For the original recipe for kids that we posted in our other blog, here is the link for the same. The beauty of this recipe is the flexibility of adding different vegetables (well, the ones that are compatible of course). Here my wife used zucchini and carrots for Tvisha. I am keeping the recipe simple and modifying it so it includes only zucchini. Very small bunch fresh basil leaves (10-15 leaves) chopped very fine. Grate the zucchinis with a fine grater. Add salt, cumin seeds, chopped chillis, chopped basil (this can be substituted with coriander or parsley, depending on your preference), and the whole wheat flour. Mix the ingredients into a dough with 2 tsp of vegetable oil and 1 cup of water. You can add or reduce the water and/or whole wheat flour in order to make sure that the dough doesn't get too sticky. Roll the dough into small balls and shape them with a rolling pin into round thin tortillas (my daughter still calls it a pitathi, a combination of pizza and chapati). Pan fry both sides with oil. This can be eaten with plain yogurt, lentil or tomato soup, with pickles, or by itself. I think spreading fruit jelly/jam/preserve, rolling it up and eating it would be very tasty :-). Substitute Ingredient/s: The other vegetables one can use are carrots, potatoes, pumpkins, cauliflower, fenugreek leaves, white raddish, cabbage, etc. Just make sure if you are using any vegetable combinations, they are compatible and not too watery or you will have a certified mess in your hands. For those who aren't vegan, use dollops of butter to cook the tortilla and the taste goes to another level ;-). But then it would cease to be healthy, right? Anita is my wonderful wife, and when in the mood can cook up a storm, especially desserts and baked products. She works in New York and is in the research field. She likes to try out new dishes (again only when she is in the mood), and always loves to critique my cooking ready to find any fault even if there isn't one :-). I will credit her fully for pushing me to start the two blogs that we maintain currently. I am trying to get her to try out new dishes more often.